Remember when 77% of you voted to see early 200-series Volvos in this series? Well, your day has come! I remembered that poll the other day and set out looking for a good example of such a car. 25 seconds later, I found this '80 DL (yes, Saab lovers, Alameda has about five Volvo 200s per block... and just one old Saab on the whole island). I really wanted to shoot a 262C Bertone, but the only one I've seen in Alameda is parked in a driveway (with a blue tarp lashed over the roof) and thus ineligible for this series. Of course, we believe Volvo 200s really belong on the racetrack (and we're walking the walk when we say that, too). But they're still on the street in huge numbers. The Die Is Cast: Work Begins On 24 Hours of LeMons Car! I spent a summer in southern Sweden as a teenager, and the family I was visiting had an '80 DL just like this one. Same color, but without the JC Whitney plastic hubcaps. We even took a road trip all the way up to Göteborg, where I visited Volvo's museum. 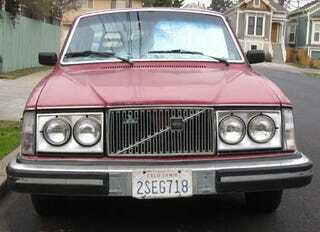 And yet, even with all this serious exposure to the glories of the Volvo 200 series, I still prefer the Amazon. You say these cars are strictly about function, with no unnecessary decoration? Check out this stolid whimsical bit of pillar trim! Hmmm... is it just covering up a weld line? I always figured the "Lamda Sond" emblem on these cars meant "Ja, here is the powerful engine for the hoonage, you betcha!" But no- it means the engine is equipped with an oxygen sensor-based fuel-delivery feedback system. How exciting!